To order or request a quote click on the button below. You will be taken to a form where you may submit contact information and measurements. All weather is good weather in Tiger Angel Element Pants! The Element Series was developed in Melbourne, Australia. This is a city with a complete range of weather conditions and that can be in just one day! The Element excels in it all. Manufactured with an outer shell of three layer laminated Cordura® and Gore-Tex® membrane. This technical fabric is perfect for motorcycle clothing. Additional abrasion protection is provided by double stitched layers of 1000D Ballistic nylon in the knees and seat. Integral Sport-X mesh liner - durable, comfortable and moisture wicking for exceptional comfort. Knee and shin guards from the BODY DEFENCE SYSTEM. In winter stay warm and dry. The garment is completely windproof and waterproof. Heat robbing moisture build up from the inside is minimal due to the remarkable breathability of GORE-TEX® fabrics. Lightweight thermal underwear is all you will need! In summer all you have between you and the outside world is comfortable Sport-X mesh and hyper breathable GORE-TEX® fabric. You stay comfortable and can enjoy your riding. 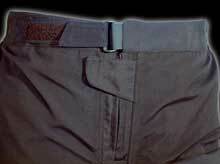 The pants are pre-cut into the riding position and sit completely flat over the saddle. Bulk is minimal due to the use of GORE-TEX® three layer laminate fabric - there are no extra "waterproof" layers liners hanging behind the outer layer to crease and bunch. 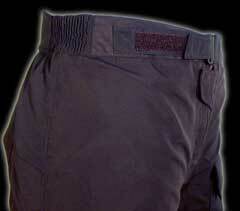 Stretch panels in the waistband give a forgiving fit. The front zip is protected by a flap to prevent tank scratching. 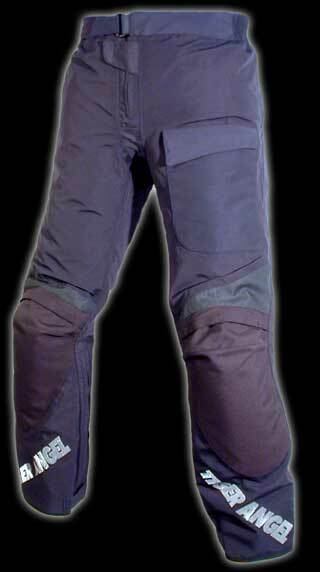 The Element pants are designed and manufactured by Tiger Angel to be a long term reliable investment. GORE-TEX® fabrics and the manufacturing process are rigorously controlled and tested. Unlike coated "waterproof fabrics", the GORE-TEX® laminated fabric can be safely machine washed as often as you like. Years later you will be wondering why you ever considered anything else.